Chinese communications technology satellite. Communication satellite for CAS, China. Launched 2003-2014. AKA: Chuang Xin. Status: Operational 2003. First Launch: 2003-10-21. Last Launch: 2014-09-04. Number: 4 . Gross mass: 88 kg (194 lb). Chuang Xing 1 (Creation 1) was a store and forward communications microsatellite developed by the China Academy of Science, Shanghai Academy of Space Technology, and Shanghai Telecomm. The environmental test model at the end of 1999. The flight model was to be finished in 2001 and launched as a piggyback payload aboard a Chinese booster. Family: Communications technology sat, Technology. Country: China. Launch Vehicles: Chang Zheng 2D, Chang Zheng 4B. Launch Sites: Jiuquan, Taiyuan, Taiyuan LC1. Agency: CAS. Bibliography: 424, 12197, 12198. 2003 October 21 - . 03:16 GMT - . Launch Site: Taiyuan. Launch Complex: Taiyuan LC1. LV Family: CZ. Launch Vehicle: Chang Zheng 4B. Chuangxin-1 - . Payload: Chuang Xin 1. Mass: 90 kg (198 lb). Nation: China. Agency: CAS. Class: Technology. Type: Communications technology satellite. Spacecraft: CX-1. USAF Sat Cat: 28058 . COSPAR: 2003-049B. Apogee: 759 km (471 mi). Perigee: 686 km (426 mi). Inclination: 98.50 deg. Period: 99.20 min. 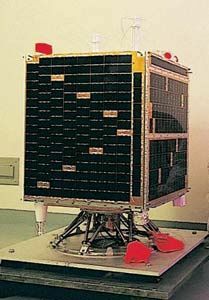 Chuangxin-1 (or Innovation-1) was China's first experimental small satellite for store-and-forward short message data communications in low Earth orbit. With a mass less than 100 kg, the Chuangxin-1 was developed in light of national strategic demands. Starting from 1999 with support of the national Knowledge Innovation Program of the Chinese Academy of Sciences (CAS), the project was carried out jointly by researchers from the CAS Shanghai Institute of Microsystem Information Technology and the CAS Shanghai Institute of Technical Physics. The satellite used spread spectrum communication and subsystems included a communication transponder, onboard computer, attitude control, energy source, thermal control, and structure. The mission was to demonstrate data communications for such sectors as traffic and transportation, environment protection, oil and gas transportation, flood and drought control, detection of forest fire and earthquake monitoring. 2008 November 5 - . 00:15 GMT - . Launch Site: Jiuquan. LV Family: CZ. Launch Vehicle: Chang Zheng 2D. Chuangxin-1-02 - . Mass: 90 kg (198 lb). Nation: China. Agency: SISE. Class: Technology. Type: Navigation technology satellite. Spacecraft: CX-1. USAF Sat Cat: 33433 . COSPAR: 2008-056A. Apogee: 805 km (500 mi). Perigee: 785 km (487 mi). Inclination: 98.50 deg. Period: 100.80 min. 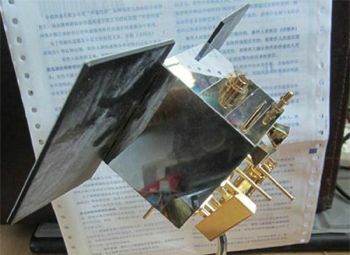 Microsat built by the Shanghai Institute of Microsystems and Information Technology) and the Shanghai Academy of Space Technology. The satellite was designed to collect and relay hydrological and meteorological data and data for disaster relief..
2011 November 20 - . 00:15 GMT - . Launch Site: Jiuquan. LV Family: CZ. Launch Vehicle: Chang Zheng 2D. Chuangxin 1-03 - . Mass: 88 kg (194 lb). Nation: China. Class: Technology. Type: Technology satellite. Spacecraft: CX-1. USAF Sat Cat: 37930 . COSPAR: 2011-068A. Apogee: 805 km (500 mi). Perigee: 784 km (487 mi). Inclination: 98.50 deg. Period: 100.80 min. Store-dump communications satellite developed by China Academy of Science, Shanghai Academy of Space Technology, and Shanghai Telecomm..
2014 September 4 - . 00:15 GMT - . Launch Site: Jiuquan. LV Family: CZ. Launch Vehicle: Chang Zheng 2D. Chuangxin 1-04 - . Mass: 90 kg (198 lb). Nation: China. Spacecraft: CX-1. USAF Sat Cat: 40137 . COSPAR: 2014-051B. 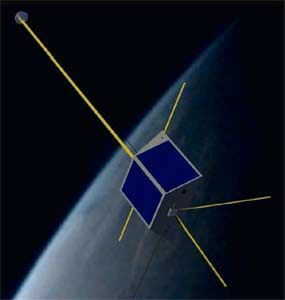 Apogee: 810 km (500 mi). Perigee: 777 km (482 mi). Inclination: 98.45 deg. Period: 100.74 min. Satellite from the Chinese Academy of Sciences, for message data relay, in a sun syncronous orbit with 06:30 local time of descending node..